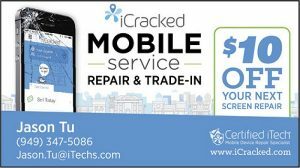 CityWatch (February): David vs. Goliath! Whether taken as the literal truth or simply as an inspiring parable, the Biblical story of David vs. Goliath holds special meaning for just about all of us. The idea that a boy, David, armed with nothing more than a slingshot and some rocks, could successfully defend his community against a fearsome giant, Goliath, speaks to our affinity for the courageous underdog who manages to defy the odds and defeat a powerful foe. Throughout 2017, three City Councilmembers — I think of them as Goliath’s helpers…Mayor Don Wagner and Councilmembers Christina Shea and Melissa Fox — have pushed ahead with FivePoint’s deeply unpopular “replace-and-rezone” scheme. This is the developer’s dream scheme to have the Council replace the long-planned Veterans Cemetery in the Great Park and rezone the property, transferring it to FivePoint to develop huge office, commercial and industrial projects. Of course, this will produce hundreds of millions of dollars in windfall profits for FivePoint, but intolerable added traffic and a diminished quality of life for the rest of us. So, with Goliath on the move, this time pressing forward with crushing new development to replace the Veterans Cemetery in the Great Park, who is taking the role of David in this high-stakes Irvine drama? Well, in this case David is not a boy armed with a slingshot. David is us! 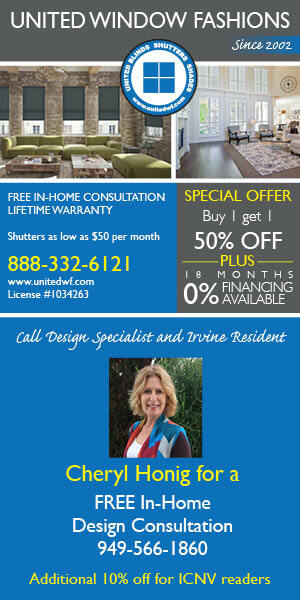 David is the thousands of Irvine citizens who circulated and signed Referendum Petitions to put this FivePoint development issue on the June 5, 2018 ballot for Irvine voters to decide. We now have the chance to fight back against FivePoint and other special interests. Together, we are all David. We can say NO by voting NO on June 5th. We can overturn the odious replace-and-rezone ordinance adopted by just three members of the Irvine City Council, at the behest of developer FivePoint. The Referendum hasn’t received a ballot designation yet — that probably won’t happen until March. But whether it is designated as Measure A, Measure G, or Measure Z, remember this: Now that we have the power to vote NO on June 5th, we must use it! 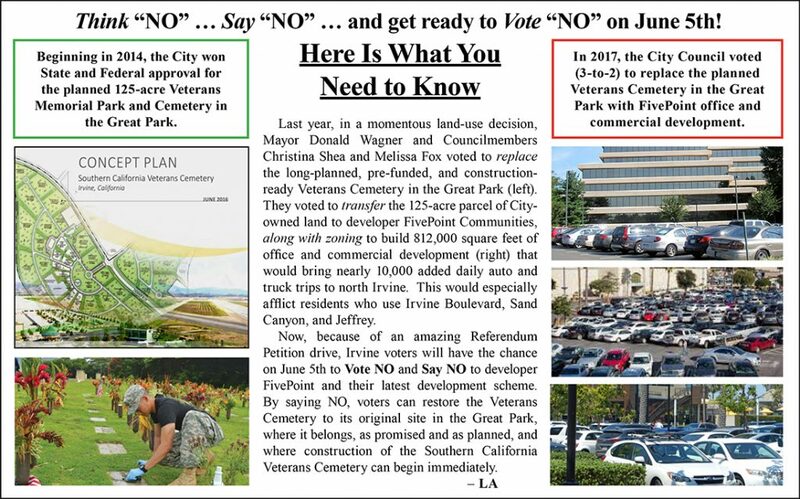 If, together, we say NO by voting NO, we can push back against Goliath, and we can get back to the business of immediately building the Veterans Cemetery in the Great Park, as originally planned and promised!